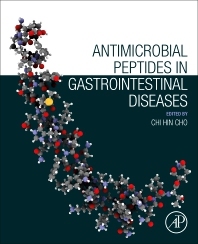 Antimicrobial peptides (AMPs), including cathelicidins and defensins are host defence peptides that carry out multiple roles in the gastrointestinal (GI) tract. Antimicrobial Peptides in Gastrointestinal Diseases presents knowledge about the physiological functions and pharmacological actions of AMPs in inflammation, cancer, and further infection of the GI tract. The book provides coverage from the basic research to clinical application for GI diseases. Current research and development of AMPs is presented, opening the way for further work on these peptides, not only in the context of GI diseases, but also for similar pathologies in other organs. AMPs are key to the regulation of human microbiome and second line defence in the GI mucosa, prevent colonization of pathogens and modulation of innate response to invading pathogens, and modify immunological reactions during inflammatory processes and oncogenic development in the GI mucosa. More importantly, AMPs possess diversified anti-microbial actions against various infectious diseases in the GI tract. With these physiological functions and pharmacological actions, AMPs have significant potential as therapeutic agents for the treatment of inflammation, cancer and further infection in the GI tract. Professor Chi Hin Cho is Distinguished Professor of Pharmacology at Southwest Medical University in China. His current research interests focus on drug development for inflammation and cancers in the gastrointestinal tract. He has served on leading journals in the fields of gastroenterology and pharmacology and as editor of seven books related to inflammation and cancer. He has held numerous senior positions, including the Chair of Pharmacology at Hong Kong University, Chairman and Professor of Pharmacology at the Chinese University of Hong Kong (CUHK), and Research Professor and Associate Director of the School of Biomedical Sciences in the Faculty of Medicine, CUHK. Professionally, he was the President (2006–2010) and Chair of the Presidential Council (2012–2015) of the Gastrointestinal Pharmacology Section of the International Union of Basic and Clinical Pharmacology, and council member of a number of professional bodies in ulcer research and gastrointestinal pharmacology.